Print out a free Masterpiece Mix Lesson Plan or a coloring page. Send a SASE for free bookmarks or personally signed bookplates. did a darling 60-second video in her integrated classroom. Rocco Staino of KidLit TV did an interview with Roxie for their Storymakers program. There's a fun article, with photos, by Eric Van Raepenbusch . His four kids did an art scavenger hunt based on the book at the National Gallery of Art , Washington DC. And Elizabeth Dulemba did an interview about how the book was created. Check out Roxie's schedule - maybe she will be appearing near your town! Get a signed Masterpiece Mix limited edition print. Read great reviews for Masterpiece Mix. coloring sheet (click on Download File on right). 8.5x11 paper or 11x17 paper (best). Create your own art world! If you'd like FREE signed bookplates, send a SASE (12 per envelope) to Roxie Munro Studio, 43-01 21st Street, #340, Long Island City, NY 11101. Include children's or school's name(s) to personalize. An interview published by Elizabeth Dulemba on the process of "Making Masterpiece Mix"
Rocco Staino of KidLit TV did a video interview for their Storymakers program! Fun article by Tara Lazar on process of creating Masterpiece Mix. A darling 1-minute video by Occupational Therapist Jo Booth, using Masterpiece Mix in an integrated classroom (typical and special needs children). 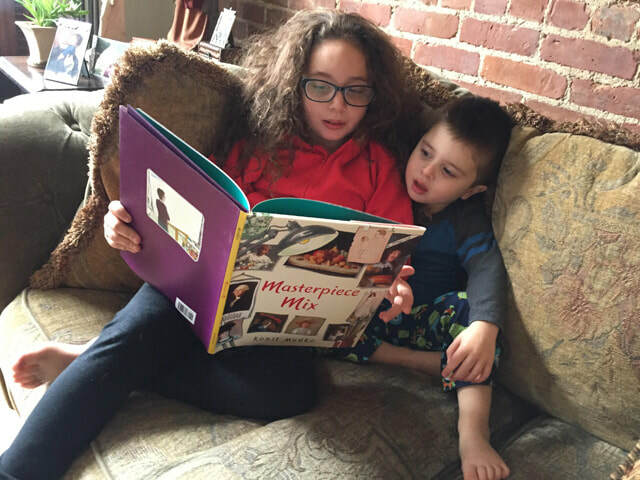 Summer, 10, and Wolfy, 3, reading "Masterpiece Mix" (sent by their granddaddy, Marvin). 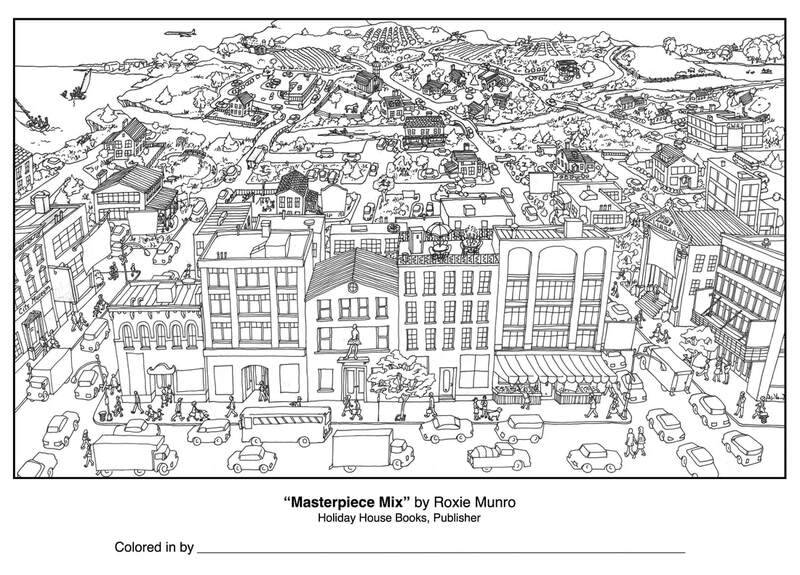 ​For FREE coloring pages to download, and more information (including a free students activity project) on the companion book to "Masterpiece Mix," called "Market Maze,"
Giclee prints individually signed and numbered. Edition of 75. Image 11" x 18" on 17" x 22" acid-free 100% cotton rag fine art paper. Shipped flat, mounted on acid-free foam core. $250. S&H included in price. "Masterpiece Mix" made Bank Street's BEST BOOKS 2018 List ! Looking for a fresh and inviting introduction to academic painting genres such as still life, portrait, or landscape? Why not bring readers inside an artist's studio (perhaps author/illustrator Munro's own?) and actually show them the process? Munro begins with preparations to paint: stretching and gessoing canvas, selecting the right tubes of colors, choosing brushes, palette knives, and solvents, setting up a palette for painting, and so on. It's lots of work…but the really hard part about painting is deciding just what to paint. In demonstrating her decision-making process, Munro uses 37 iconic and inspiring examples of fine art, each illustrating a genre for consideration, all drawn from the open-access collection of the National Gallery of Art and all representing an energizing variety of European and American artists, eras, media, and styles. She cleverly brings all these images together in a detailed, ambitious, culminating ink-and-acrylic cityscape. This signature image of an art-bedecked, lively metropolis also works as an art scavenger hunt. As readers discover the art embedded in a landscape, they can refer to the smart, concise, marvelously amplifying backmatter. "The Best New Children's Books"
Just as a graphic-novel presentation may ease a young reader’s access to the eldritch world of Poe, so art books for children use informality to make fine art accessible to the potential young connoisseur. Pictures are made to seem friendly and undemanding. In the picture book “Masterpiece Mix” (Holiday House, 32 pages, $16.95), Roxie Munro achieves this effect by setting great paintings amid her own cartoon-style drawing. Huffington Post: By children's book reviewer, Vicki Cobb. One of the most often-asked question from kids of authors and illustrators is: “Where do you get your ideas?” What they really want to know is, “ ‘How can I be like you?’ ” In author/illustrator Roxie Munro’s latest book, Masterpiece Mix, she introduces her readers to a story of the process of creativity and presents them with new ways to look at art and their own environment. Like the last book I reviewed, Seagrass Dreams, this is a multi-leveled, innovative, different kind of picture book where interactivity can lead to new discoveries at every reading. For many, at this instance, their minds are as blank as what they’re looking at. So Munro offers suggestions by showing us how other painters have solved the problem with reproductions of art from museums and books. We see works by the great masters of different genres: still life, landscape, portraits, animals, figures, and the arts and even sports. The paintings are accurately rendered and the subtext is that part of the creative process is to study the craft of masters. Then she tells us her father’s advice, “Paint what you love.” Roxie loves cityscapes and what an amazing cityscape she creates for the culmination of the book! I will tell you only that it is brilliant and that it is also a puzzle that the child and adult reader will return to again and again. The back of the book is extremely important as it is here that she identifies all the great paintings she admires and has previously shown. And she gives the reader the key to where you can find them her own masterpiece. A master is a person who gets inspired by a vision in his or her mind, of what they want to create because they have invested time in study, developing a craft (no small thing) and practice. If they’ve gone public with their works, they get opinions of others which can help or hurt. Bravely, they persevere. If they’re lucky, they reach the top of their game, as Roxie Munro has, where there is a seamless connection between what is in her mind and on the page—a masterpiece of its genre. Brava! Roxie! ​The genius of Munro's work lies in her ability to create a story, add a game element, and then take the book one step farther, creating layers of visual complexity within a picture book format. On the surface, Masterpiece Mix consists of a simple narrative: an artist facing a blank canvas seeks inspiration for her next creation. Seems fairly straightforward. There follows a series of explorations of various types of paintings: landscape, portrait, still life, as well as other artistic expressions found in images curate by the National Gallery of Art. So that's fun: comparing various subjects and styles of painting. Munro wants to paint what she loves: her neighborhood. So she moves beyond the walls of the National Gallery and sets this book in her own community. ​With the accomplished strokes of the artist's brush, she brings this masterpiece into her own environment. That's where the gamification commences. Her neighborhood becomes a repository for these masterpiece images. Readers will enjoy locating the art reproductions, referring back to the pages on which each is introduced and then, observing the clever placement of each classic showpiece within the neighborhood. For example, Cassatt's sketch of mother and child is located at the Day Care Center, The Degas sculpture of a ballerina is found in front of the Dance Studio. A map key with corresponding images and descriptions of the art is located on the back pages. MUNRO, Roxie. Masterpiece Mix. illus. by Roxie Munro. 32p. Holiday House. Aug. 2017. PreS-Gr 3–Munro introduces children to fine art using a search-and-find game and a fun framing device. A fictional artist, possibly modeled after the author/illustrator herself, is gathering her tools and supplies and deciding what to paint. She considers still lifes, landscapes, portraits, sport scenes, and more. The illustrations integrate Munro’s colorful ink drawings of the artist’s studio and town with reproductions of famous artworks, selected from the collection of the National Gallery of Art in Washington, DC, by painters such as Judith Leyster, Robert S. Duncanson, Vincent van Gogh, Paul Cézanne, James Abbott McNeill Whistler, Peter Paul Rubens, and Johannes Vermeer. The ending unveils the cityscape the artist has created, which incorporates all 37 masterpieces she had previously admired. In the back matter, thumbnail descriptions of each of the masterworks yield interesting tidbits for those who delve further: Winslow Homer illustrated 13 children’s books; Mary Cassatt, famous for figure painting, was barred from life drawing classes because of her gender; and Claude Monet did more than 250 paintings of the same pond. This simple story covering the basics of painting and drawing—materials, subject matter, and art history—can be absorbed in a few minutes by preschoolers, but the searching game and the intricacy of the artwork lend themselves to more thorough investigation by older children and those with longer attention spans. VERDICT Recommended as a versatile introduction to fine art for elementary schoolers. double duty: it introduces famous artworks while emphasizing the importance of looking at both great art and one’s surroundings for inspiration. Munro’s ultimate painting is filled with teensy details, which will be fun to hunt for, and an answer key identifies each inspiring artwork in more detail. Aspiring artists will be captivated. a tote bag, a computer monitor. The artist considers still lifes, landscapes, and portraits, as well as a variety of subjects such as sports, animals, and the arts. Her decision? She paints the view out her window and imagines the artwork found in her studio decorating the neighborhood. A Whistler figure study of a woman in white is seen on the wall of a bridal shop; a George Bellows painting of boxers decorates Al’s Gym. Like so many of Munro’s books, this one is hard to categorize. In the end, it’s a book about art and artists, and also a puzzle book. white and male, plus one African American man and two white women). Masterpiece Mix by Roxie Munro has been an enormous hit at EasterSeals in our preschool. thick pages that are perfect for repeated readings and the handling of preschoolers. little bit about the artist. inside of them too. And what a message that is!